TAG Blog: Get your tickets to the Day At The Races! 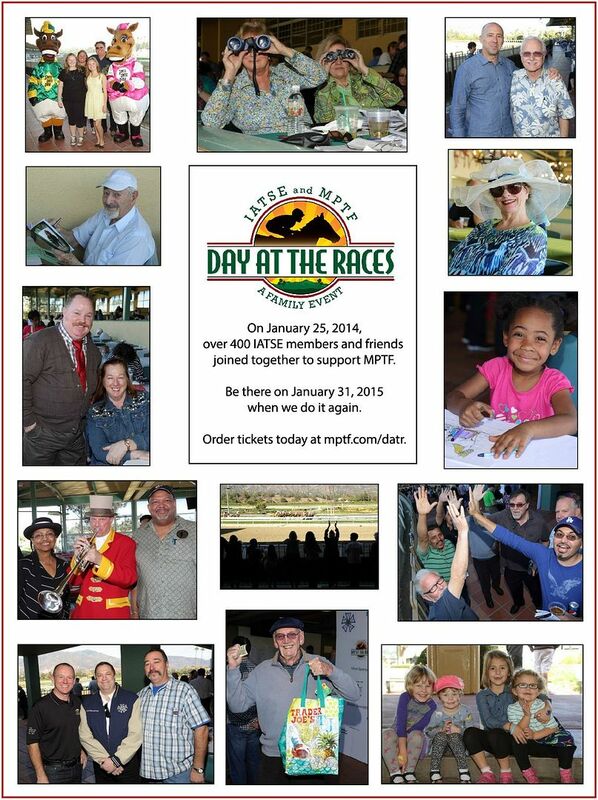 The 2015 IATSE and MPTF Day At The Races will be held on Saturday, January 31st. The Day At The Races is a family oriented fund raising event benefiting the Motion Picture Television Fund (MPTF). The MPTF has provided a safety net of programs and social services to the entertainment community for almost 100 years. See the video made from last year's event. Get your tickets on MPTF's Day At The Races Page. Your ticket buys admission, parking, a lunch buffet and access to the racing, raffles, silent auction and children's activities. Join fellow members and their families in an afternoon filled with fun and frivolity that helps to keep MPTF the charity organization that keeps Hollywood "Taking Care of it's Own".